Let The Good Times Roll by Lush is an exfoliating face and body cleanser that contains polenta, maize flour, cinnamon powder, corn oil and popcorn. It is also vegan friendly. Whilst the polenta and maize flour exfoliate, cinnamon powder revives and stimulates. The final result is fresh, soft and glowing skin. It comes packaged in a typical black, Lush branded pot with a screw cap lid that holds 100g or 250g of cleanser. As with other Lush products, if you take back five Lush pots or tubes to any of their stores then you will receive a free Fresh mask. At first, Let The Good Times Roll looks a little confusing due to the fact that it comes in solid form (so that it is self-preserving), but it is very simple to use. You need to take a pinch and place it in the palm of your hand. Add a couple of drops of water and mix it into a paste. Apply the paste to wet skin, massage and rinse thoroughly. If you have ever tried Angels On Bare Skin, another exfoliating cleanser by Lush, then you may find yourself thinking that they are similar. In all honesty though, I genuinely prefer Let The Good Times Roll over Angels On Bare Skin. Whilst Angels does leave the skin feeling really smooth, I think that it is slightly more towards those with oilier skin due to the fact that it dries the skin out a little more than Good Times. Good Times however seems to be an all-rounder, suitable for all skin types without any drying. 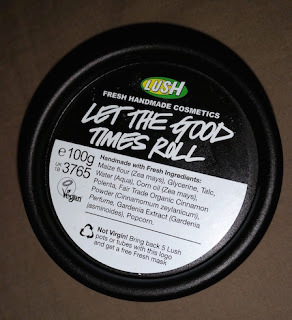 Let The Good Times Roll leaves your skin feeling incredibly soft. So soft, in fact, that I swear I spend most of the time post-wash simply touching my own face (and I bet I’m not the only one!). In addition, it adds a nice glow that doesn’t look greasy, meaning that even those with oilier skin can fall in love with this product. It also helps the skin feel and look much fresher, so it’s great to revitalise when you’ve had a fair few late nights. To top it all off, the smell is absolutely divine. It smells like buttery popcorn, good enough to eat (but don’t eat it, obviously)! It’s not the type of product that you need to use every day, but you could if you so wanted. I tend to use this roughly three times a week, but the frequency of use is really down to personal preference. The only irritating thing about this product is the popcorn pieces that are included. Whilst they look great all mixed into the exfoliator, they are effectively a waste of space. What can you do with them? Nothing. Therefore, you need to pull them out as you use it. The popcorn pieces also vary in size, so in one batch there may be full-size lumps to fish out whereas in another you may have crumbs that you can leave untouched. It’s almost some sort of gamble! Overall, if you are on the hunt for a new exfoliator (and even if you’re not), I wholeheartedly recommend trying this one out. 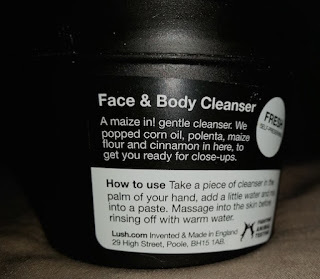 It’s a little beauty, easily one of my favourite products from Lush (and there is some serious competition in that area!). Also, if you are interested in a fantastic complimentary product, I suggest that you take a look at Movis facial wash which is also by Lush. 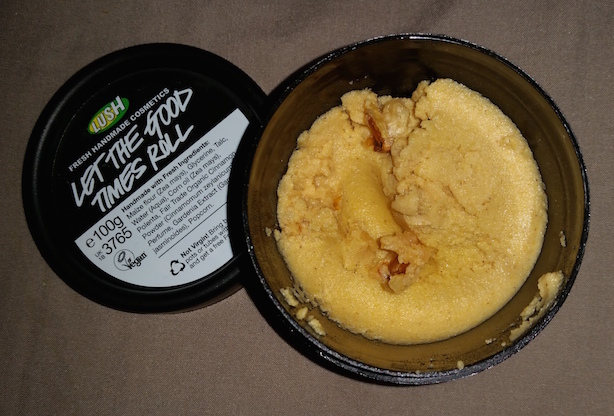 You can buy a full-size pot of Lush’s Let The Good Times Roll in two different sizes. It is £6.75/100g and £16.88/250g from Lush. What are your thoughts on Let The Good Times Roll? What is your favourite Lush product? Awesome post! I've never tried Lush, but I really want to!